Where we are: Click below link for map directions ! WELCOME TO DAIRYLICIOUS FARM FUDGE Australia’s favourite farm fudge. Lynda has been making fudge for over 20 years privately, using her own home made very labour intensive recipe. Ninety nine percent of makers do not use this method as it is too involved. 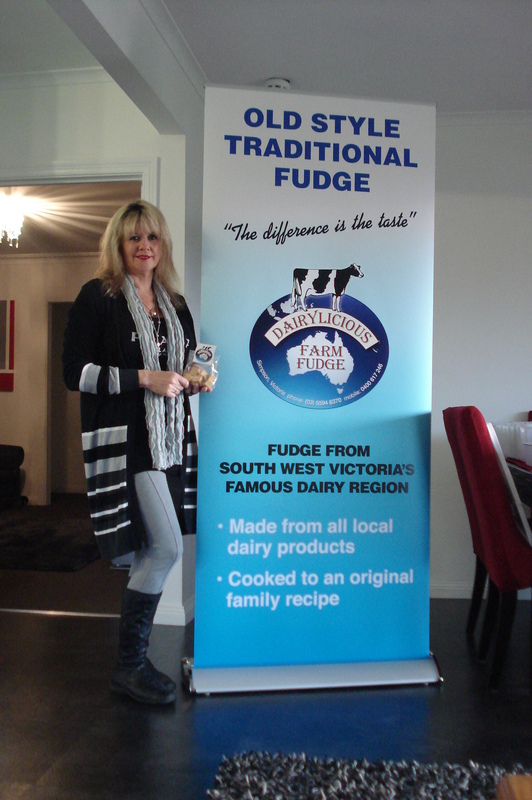 We introduced to the market in January 2015 Dairylicious Farm Fudge offering Fudge with a distinct difference. Our home made version developed from a cooks hobby into a small business after people asked us to sell them our unique caramel fudge. 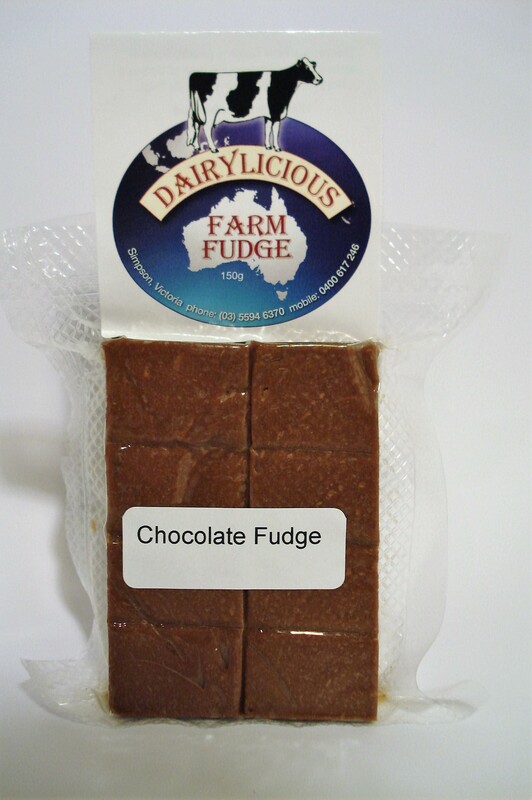 You can now buy fudge online here ,and via Facebook linking with our website: www.farmfudge.com.au. You can contact the makers Lynda and Peter direct anytime on 03 55946370 or send an email to our new site; info@farmfudge.com.au. After your tasting at local tourist outlets you will find you want more than just one bag so our new website allows you to buy fudge online in Australia using Australia Post Express bags with very quick delivery to your door. We have released early November 2016 Chocolate Coated Fudge Slices which are luxuriously coated in expensive world famous best quality chocolate. Now theres a real difference others do not offer! softer, creamier and exclusively the best Australian ingredients are added to our unique mixing whilst cooking caramel method . We offer a true original very best fudge available in Australia today. Gift hampers will be compiled in early November offering a fantastic gift idea for all year round including Christmas. 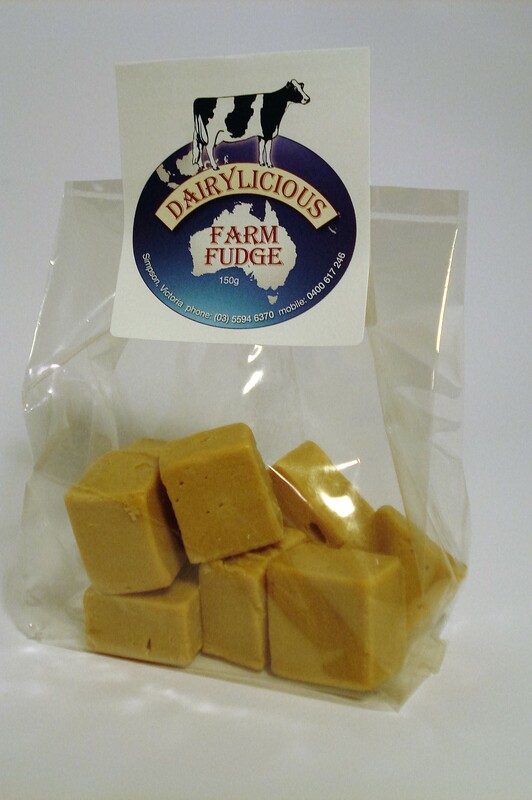 Want to know more about Dairylicious fudge ? Most other Fudge is made from basic powder packet mixtures by simply adding water ,cream and other additives ;Their fondant based mix is warmed partially and cooked at a low temperature. It is basically heated combined, worked, and served like flavoured icing. Our Fudge contains all natural products, is boiled to a full caramelised state using only local export quality buttermilk powder, local highest quality cream and other local ingredients. The mixture is cooked at 116 degrees for approximately an hour. At this stage special ingredients are added here, blended and whipped to a super light smooth texture. The product is dried overnight and made fresh to each persons order. (B) CHRIO PACKED ”Eat Me Later’’( FOR ALL MAIL CLIENTS ) bags offer longer life! ideal for hampers and keepsake. expect 3-4 months “Best Before Date” packaged. These are vacuum cryogenically sealed and packaged. Hi, Jan from Gellibrand Blues and Blueberry Festival. I would like your email address please, to send you details of our Market on the Sunday of the Festival. We want to showcase local produce. I bought a vac sealed pack of Coconut Cream fudge from the visitor centre at 12 Apostles last week. It was gone by the evening. By far the smoothest, creamiest tasting fudge I’ve eaten. I have since bought 2 x coffee, 2 x choc orange, choc coated mint and another Coconut Cream. I mentioned your fudge to Bellbrae Estate who said they’d look into your product. I need to find a stockist in Melbourne now.